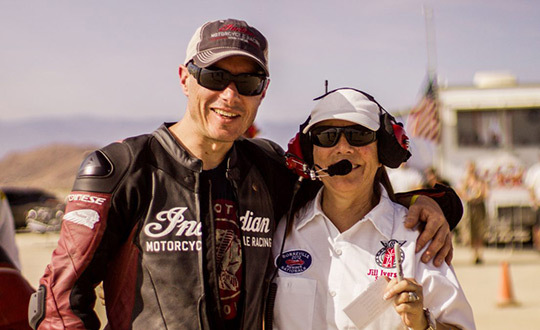 According to the Southern California Timing Association (SCTAI) Indian Motorcycle has set three new land speed records,) at El Mirage, California. Indian was out at El Mirage with three machines – a 2015 Chief Classic, a 2015 Indian Scout and the 2017 Spirit of Munro Scout. Two Indian Motorcycle technicians and Burt Munro’s great nephew, Lee Munro, were riding the bikes that entered the record books. The first of the three Indian riders was Chet Michaelson, an engine calibration technician at Indian Motorcycle. 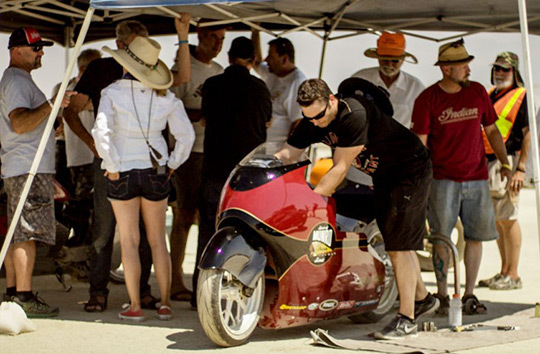 In the M-PG (Modified-Pushrod Gasoline) 2000cc class, riding a 2015 Indian Chief Classic, Chet beat the old record of 151 MPH (243 km/hr) with a speed of 154.132 MPH (248 km/hr). 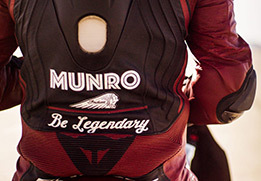 The second Indian rider was Lee Munro – aboard the Spirit of Munro 50th anniversary 2017 Indian Scout. Competing in the MPS-G (Modified Partial Streamliner) 1350cc class, Lee needed to exceed 167 MPH (268.76 km/hr) for a new record. After completing his rookie runs during the May meet at El Mirage, this was the first chance to let the bike loose and explore its potential. Lee recorded a speed of 186.681 MPH (300.43 km/hr), a new record and the Indian team was two for two. The third and final Indian rider was Dan Gervais, senior engine calibration technician at Indian Motorcycle. Dan was competing in the M-G (Modified-Gasoline) 1350cc class with a lightly modified 2015 Indian Scout. Like Lee Munro, Dan also completed his rookie runs at the May meet at El Mirage. Dan’s speed of 154.354 MPH (248.40 km/hr) edged out the 153 MPH (246.23 km/hr) record and gave Indian its third record of the day. Lee’s record-setting run at El Mirage was the team’s final set of test runs before heading to the Bonneville Salt Flats. 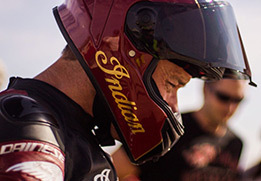 This coming August 12 and 13, Lee Munro will pilot the modern Indian Scout with a powertrain modified by the Indian Motorcycle engineering team. This commemorative speed run will not break Burt’s record, but instead will honour the passing of 50 years since Burt first set it. Indian’s team of engineers volunteered to be a part of this historic attempt, working on the project ‘after hours’ and fueled by their own ambition to push beyond the boundaries.